We provides daily list of Newly Registered Domains of UK with whois information containing Phone number, email & address etc. for just $35/Month. Most of the ccTLD registrars do not publish the list of newly registered domain names. So we are unable to provide you a daily database of newly registered of .uk, .co.uk domains at this time. In newly registered domains of UK you get the other tlds like .com, .net, .org, .biz etc around 539 tlds. 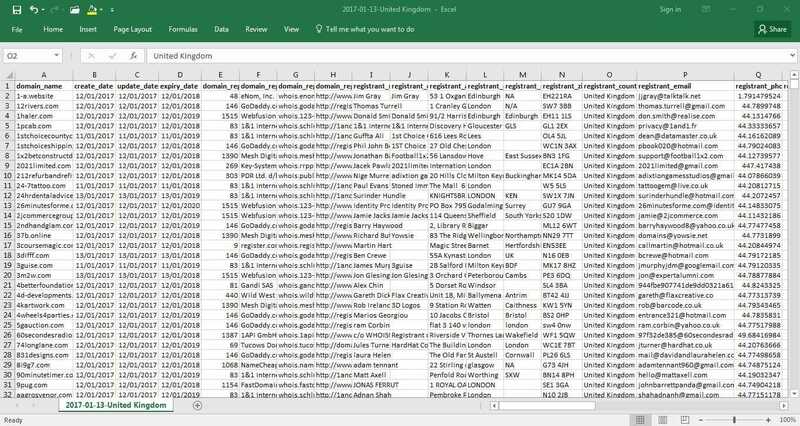 This sample database contains UK Domain Name Owner databases (Whois Databases). All these data are accurate and latest. Please find the sample databases attached below, you can also buy full package for just $35/Month.